Eco-friendly(no electricity required), unbreakable(abs plastic), convenient & easy handling, sturdy(stainless steel blades). 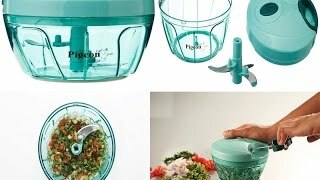 The lowest price of Pigeon New Handy Chopper with 3 Blades, Green was obtained on April 19, 2019 11:42 am. 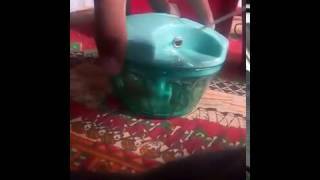 Pigeon New Handy Chopper with 3 Blades, Green UNBOXING and Hands On In Hindi..
Pigeon New Handy Chopper with 3 Blades: A handy kitchen essential, this vegetable chopper from Pigeon is designed to assist you in your cooking task. This lil fellow does his job well. Hassle free. It’s a bit tiny & you can use 2 small/medium sized onions to get sliced pieces in a jiffy. A must one for Kitchen. Recommended. This is a tiny, tiny chopper. It works, but it is absolutely tiny. My weird-branded chopper that I bought at a local chain store is much, much larger than this. I got it at 290 in deal.its the best chopper I ever used.its now very easy to chop onions, tomatoes, chills etc.dont go with the size.the blades are very sharp n can chop 1 kg onion in 10 min. very nice … tried cutting 2 medium size onion and it works perfectly. have to careful while handling blade. have to pull a lil hard for first 2 times. its very good product to buy. Handy chopper for chopping vegetables to fine pieces. Very convenient to use. Best equipment for college students for cooking because it saves lot of time. Can make salads in seconds. The blades are really sharp. Been using it daily and no problems till now. 4-star because of the size. Could have been more bigger. But overall its an excellent product. Sharp blades, easy to clean. I have used Prestige before – when compared to that, this is much smaller. But Prestige’s lid wasn’t easily cleanable, there was a risk of water entering inside – this one is better in that sense. Product is too good.Received today and tried to cut tindora and surprisingly it has cut very well with very less pressure and with ease. So far loved the chopper. Will write the review again after few days of using it. Bwt the blades are very sharp and need to careful while cleaning.